Many people often ask us if turntables and LPs really do sound better than other music sources, especially CDs. The answer is an unequivocal "YES! ", providing the comparison is done using equally-well recorded source material. Music played from an LP is more involving, spacious, dimensional, and just plain captivating than that played from a CD or other digital source. Moreover, This superiority is not true just for very expensive models. 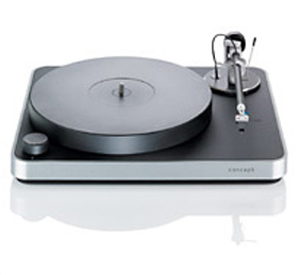 Excellent turntables are available at a wide variety of prices that can be afforded by anyone. Nevertheless, the convenience and ease-of-use of the CD has severely diminished the use of turntables since the early 1980s when the CD was first introduced. The good news is that this trend started reversing in the last few years, and many more music lovers and audiophiles of all ages, increasingly aware of the drawbacks of CD sound and, especially, of the severe shortcomings of downloaded MP3 music, have started buying turntables and LPs again. The not-so-good news is that, unlike a CD player, you can't just take a turntable out of its box, plug it in, and expect to get optimum performance. Turntables and cartridges require proper matching, installation, and alignment if you are to get the best possible sound from them. (This doesn't mean that a properly set up turntable, once you get it home, will be difficult to use or need frequent alignment because this is not the case. We are only referring to the initial setup.) Unfortunately, during the 25 or so years when turntables were in use by only a minority of music lovers, most dealers gave up on turntable sales and lost the knowledge needed to match and set up turntables/cartridges properly. Also, many new and younger turntable users have never been educated about turntable performance and the critical need for proper setup. So, it is the purpose of this article to explain the basics of how turntables and cartridges work, how turntables and cartridges should be matched, and how a dealer needs to align the cartridge/turntable combination for optimal performance. Hopefully, it will become obvious that naively purchasing a turntable over the Internet and plugging it into your system will not be nearly as rewarding as buying that same turntable from a dealer who will set it up properly before letting you take it home. 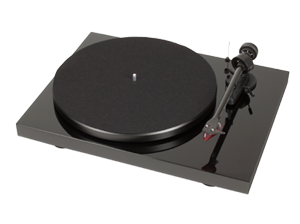 A turntable can be divided into several basic parts, the plinth, the motor, the platter/bearing, and the tonearm. Here's a brief description of what each part is and how it should work. Plinth - This is the body or chassis of the turntable. Essentially, it's the part to which everything else is mounted. It should be strong so it won't flex, and it should be heavy and solid so it won't conduct vibrations to the platter or tonearm. Turntables with cheap, lightweight, or hollow plinths should be avoided because they don't provide the solid, non-resonant platform that the rest of the turntable needs to do its job properly. 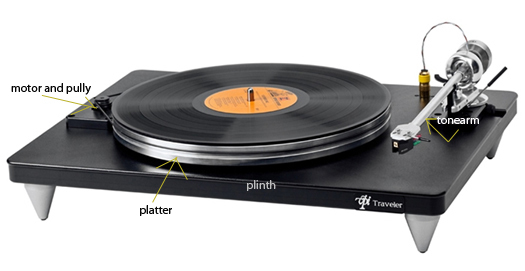 Platter/Bearing - The platter/bearing is the rotating part of the turntable that actually spins the record. Again, it should be solid and heavy so it won't conduct vibrations but will have a good flywheel effect to help keep the rotational speed constant. Some very sophisticated platters are laminated composites of several different materials with different vibration properties that, when used together, damp out undesirable vibrations much more effectively than any single material. Turntables with thin metal platters that ring like a bell when tapped will color the sound and should be avoided. The bearing should be, at the same time, very low in friction yet very tight in its tolerances to keep rotational speed constant while the platter is held very rigidly. Both binding from too tight a bearing and wiggling from too loose a bearing will have deleterious effects on the sound. Motor -This is what actually spins the platter. It sounds simple, but it is not. The motor must spin with absolutely unvarying speed so it will not speed up or slow down during record playback. Gradual changes in speed will cause the overall pitch and tempo of the recording to be wrong, while more rapid speed variations will cause what are called "wow" and "flutter", momentary speed changes that can cause the music to sound wobbly or fluttery. 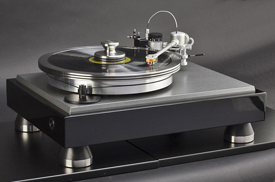 Getting a motor to provide rock-solid speed while not transmitting vibrations into the plinth is one of the most difficult tasks of turntable design. Some turntables use a synchronous motor which locks on to the 60 Hz AC current that comes out of your wall outlet to obtain their long-term speed stability. However, momentary speed variations can still occur, and there's no substitute for a well-designed and more costly motor to prevent those momentary variations. There are also DC motors that use feedback circuitry to check for speed variations and correct them when they occur. This can be less satisfactory, however, because some audible speed variation must actually occur before it can be corrected. The best turntables use a rubber belt to couple the motor to the platter, thus sending the drive energy to the platter while stopping the transfer of motor noise and vibration with the soft belt. So-called direct drive turntables have the motor physically attached to the platter, but this is inferior to the use of a belt since there's no isolation between the motor and platter. Tonearm - The job of the tonearm is to hold the phono cartridge rigidly in proper alignment as the tonearm traverses slowly across the record. To do this properly, the arm tube itself needs to be both rigid and non-resonant. The bearings that allow the arm tube to move horizontally and vertically should be of the highest quality so they will be both low enough in friction to prevent binding and yet tight enough to prevent movement or chatter during playback. A cheaply-made tonearm simply cannot do these tasks properly and will vibrate internally, causing audible colorations. High-quality arm tubes and bearings are the only way to retrieve the music from the record's grooves properly. The headshell at the end of the tonearm is angled slightly so that the cartridge can, as discussed below, be properly aligned for minimum distortion. Some tonearms, instead of having angled headshells, are curved to look sexier, but this curvature in no way improves performance and may actually degrade sonics by compromising the arm tube's rigidity. We've been referring to the phono cartridge without really describing what it is and how it works. Basically, a phono cartridge consists of a body that holds the internal parts together and the signal generating assembly that tracks the record's grooves and converts those minute groove vibrations into an electrical signal that can be amplified by the rest of your stereo into music. Inside of the cartridge are two sets of tiny magnets and coils of wire (one set for each channel) that convert mechanical vibrations into very low voltage electrical signals. Protruding from the magnets/coils and the body of the cartridge is the cantilever, and mounted on the other end of the cantilever is the diamond stylus, what some people call a "needle". The diamond stylus sits in the record groove and vibrates in two directions, controlled by the two walls of the V-shaped record groove. The two sides of the record groove contain the two channels of information for the right and left stereo channels. When the diamond moves in this groove, it causes the cantilever to move as well, and this causes electrical signals to be generated at the other end of the cantilever where the tiny magnets and coils are mounted. 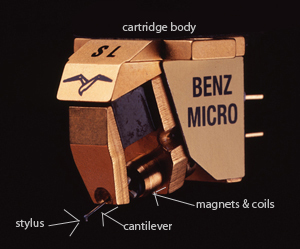 (There are actually two variations here: the moving magnet cartridge where the magnets move and the moving coil cartridge where the coils move. A discussion of the pros and cons of each type, however, is not for this article.) Then the tiny electrical signals travel out of the cartridge, down the tonearms internal wiring, down the cables that connect the turntable to your system, and into your amplifier or receiver. This sounds relatively straightforward and simple, but the simplicity is deceptive. The diamond and cantilever are very tiny, and unwanted vibrations or extraneous motion, while seeming quite trivial on the human scale of things, can look like an earthquake to the cartridge components. This reinforces the need to keep such extraneous vibrations out of the plinth, platter, and tonearm, as discussed above. It also highlights the need for meticulous alignment of the cartridge in the tonearm. If the latter is not done correctly and accurately, then the diamond stylus will not be aligned properly in the groove, and distortions will be introduced during the playback process. Properly-shaped and polished diamond styli and rigid, yet lightweight, cantilevers are also critical to proper music retrieval. When the master disk for a record is manufactured, the cutting stylus travels straight across the disk's surface, not in the curved path that occurs when a record is played on your turntable. This means that, except for a couple of points on the record surface, your playback stylus will be slightly angled compared to the position of the cutting stylus. There are precise equations that can be used to minimize this tracking angle error, and there are devices, built according to those equations, that can be used to adjust the cartridge's mounting so that tracking angle distortion will be minimized. Furthermore, the height of the tonearm must be individually adjusted for each brand and model cartridge because some cartridges are taller than others. If this is not done properly, then the vertical tracking angle (as opposed to the horizontal tracking angle discussed above) will be incorrect, causing another type of tracking distortion. Finally, of course, the cartridge's tracking force must be accurately adjusted so that the diamond will press into the record groove with just enough force to keep it seated but not so much or so little as to cause distortion or record damage. Next the cartridge must be installed in the tonearm. It must be wired properly, mounted, and adjusted with exquisite care, using the right instruments, so that the cartridge is correctly aligned vertically and horizontally. Then, it must be adjusted for proper tracking force. Finally, the whole system must be auditioned carefully to make sure everything is performing properly. Only when all of these steps are complete will we release the turntable to our customer. Nevertheless, we've been amazed at the number of phone calls we've received from people who bought a turntable and cartridge by phone or over the Internet, only to receive them in two separate boxes with the phono cartridge unmounted and the whole system untested! The dealer's responsibility to set up and align the whole turntable and cartridge properly does not go away even when we're talking about a pre-packaged turntable/tonearm combination where the manufacturer has preselected the cartridge and pre-mounted it on the tonearm. We open up every such package and double check all alignment and setup parameters before giving the turntable to our customer. We have rarely, if ever, seen one of these packages come through properly aligned. You'd think the manufacturers would take care of this in a complete package, but we virtually always need to refine the setup for optimal performance. Yet many mail order and Internet companies ship out these prepackaged systems without ever opening them up and tweaking the alignments or checking for manufacturing defects. It's a shame because their customers are not getting everything they paid for. Analog record playback is not only the oldest current method of music reproduction, but also it continues to be the best sounding method available. We've touched on some of the requirements a turntable and phono cartridge must have for high quality music playback and provided and introduction to the importance of proper turntable/cartridge matching and alignment. Lack of proper setup can degrade proper performance, even when the turntable and cartridge are excellent in their own right. If a customer isn't technically capable of performing the cartridge installation and alignment independently using proper tools and measurement devices, then a good dealer should always be selected who can perform these critical tasks. Finally, we welcome inquiries from those interested in more detailed information about turntables and cartridges, how they work, and our personal opinions and preferences.